Pez (trademarked PEZ, in capitals) is the brand name of an Austrian confectionery and the mechanical pocket dispensers for the same. The confectionery itself takes the shape of pressed, dry, straight-edged blocks (15 mm (5/8 inch) long, 8 mm wide and 5 mm high), with Pez dispensers holding 12 Pez pieces. The name Pez was derived from the letters at the start, the middle and the end of the German word for peppermint, Pfefferminz, the first Pez flavor. Pez was originally introduced in Austria in 1927, later exported, notably to the U.S., and eventually became available worldwide. The all-uppercase spelling of the logo echoes the trademark’s style on the packaging and the dispensers themselves, with the logo drawn in perspective and giving the appearance that the letters are built out of 44 brick-like Pez confectioneries (14 bricks in the P and 15 in each of the E and Z). Despite the widespread recognition of the Pez dispenser, the company considers itself to be primarily a confectionery company, and says over 3 billion confectionery bricks are consumed each year in the U.S. alone. Pez Dispensers are part of popular culture in many nations. 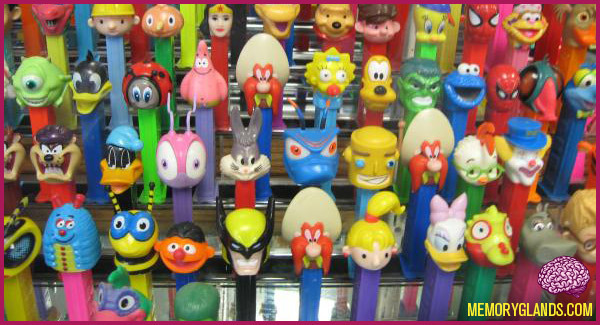 Because of the large number of dispenser designs over the years, Pez dispensers are collected by enthusiasts.